The US is a big nation. It is not only made up of 50 states and a handful of territories but it is likewise a big chunk of land mass that experiences all four seasons each year. On the average, roughly 1,200 tornadoes hit the US annually especially in the East Rocky Mountains as well as in the Midwest, the Great Plains, the South of the US and the Mississippi Valley. 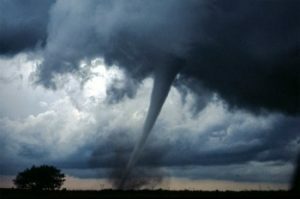 The term “Tornado Alley” is a tornado-prone part of the US that stretches from the north of Texas to Canada, the center of which is in Oklahoma and Kansas. It’s probably the reason for the plot of the infamous Wizard of Oz. In the south of US, they have the Dixie Alley that is also made of states often hit by tornadoes. Tornadoes often form during spring since the climate transitions from cool to warm and not so during winter. The months of March to June are known as the US tornado season. People living in high-risk states should be more vigilant than ever since tornadoes can form without warning. Modern technology also does its part in helping people survive tornadoes in one piece. Tornadoes ripped through southern Louisiana on Tuesday, leaving only splintered wood where houses once stood and causing dozens of minor injuries as a violent weather system barreled across the South. There were no immediate reports of deaths after four tornadoes hit the region, leaving 10,000 homes without power and prompting Louisiana Gov. John Bel Edwards to declare a state of emergency. Dozens of homes, cars and businesses were damaged. The worst of the devastation occurred in New Orleans East, where a tornado ripped buildings from foundations and left power lines dangerously strewn across roadways. James Thomas rode out the storm there in his bathroom after grabbing his motorcycle helmet for extra protection. After the danger passed, he emerged to find his house narrowly escaped the path of the tornado, which left his neighborhood encased in damage. Twisters are a sight to behold. Many are captivated by tornadoes that some even make it a hobby to pursue them. However, let us not forget how destructive its nature is and lives are lost and properties are decimated in just one strike. Those living in states that are in the path of these deadly tornadoes have learned from a young age how to prepare for when it strikes and periodic tornado drills are also practiced to increase awareness and limit casualties. A series of outbreaks that began in January has propelled the preliminary 2017 U.S. tornado count to its highest level for mid-March in nearly a decade. Two dozen people have lost their lives from tornadoes so far this year, and the waves of severe weather have contributed to economic losses of more than $2 billion. The preliminary tornado count for the year was 309 through March 20, according to Dr. Greg Forbes, severe weather expert at The Weather Channel. That is the largest number of tornadoes to this point in the season since March 2008, which had 327 tornadoes by that date. January’s tornado count of 133 was more than triple the 20-year average of 40 for that month. A preliminary count of 112 tornadoes have touched down so far in March, and that already exceeds the entire month’s 20-year average of 76. The United States have witnessed the most number of tornadoes throughout the world. So, knowing that you are in the path of these natural mammoth vacuums in the sky, it is only practical to master what to do when it comes. It is best if you can set up a basement or underground dwelling as your safe haven when tornadoes hit your area. Always try to go to the lowest part of a structure if you are in a building, it can be the center of the hallway and not necessarily the lowest floor. Participating in routine tornado drills is the best preparation of all as you learn in details what to do and what to avoid during tornado season.